This is my go to egg and dairy free cake recipe that I reach for whenever I need a child's birthday cake, including Elmo cakes for The Kid's last two birthdays. I've made it in every color of the rainbow, and once even made a rainbow layer cake. I'll be using it to make green cupcakes for a Shrek themed party in a couple of weeks. 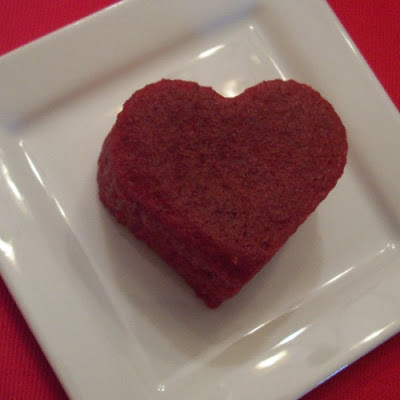 Today I used it to try out my heart shaped silicone muffin mold that I picked up from a post Valentine's clearance. I was disappointed by the mold, but the cake itself was good, as always! While mixing, slowly add the dry ingredients to the wet ones in three batches. Stop as soon as they are completely combined. Divide the batter evenly between the two cake pans and bake for 30 minutes until a toothpick comes out clean from the cake. Cream margarine in a mixer bowl, than gradually add sugar while continuing to mix. Once combined, mix in the lemon juice. Comments for this post have been disabled due to spam. If you have a question about this recipe, please email me at allergiesmom@gmail.com. That's a wonderful cake Libby. It looks gorgeous. I've seen Paula Deen preparing it with eggs, but wow, this is pure deliciousness. I have not used egg replacer so far. Will try it one of these days. Where can I get it, any specialty shop or Whole Foods? Thanks for submitting the recipes, I'll update it when I get enough entries. You're right, this looks fantastic. Thanks for the heads up! Husband recommends substituting coconut milk for the oil. Because it is awesome, and healthy and it's the "baker's duct tape"--it fixes everything.